After ten years of anticipation, The Missionary Sisters of the Sacred Heart of Jesus proudly announced that construction and restoration of the National Shrine of Saint Frances Xavier Cabrini, 2520 N. Lakeview Ave. For the past ten years, the Shrine, which was once the chapel of the former Columbus Hospital, has been covered with canvas and supported by scaffolding in an effort to preserve it. Once the Shrine was no longer surrounded by Columbus Hospital, the opportunity arose to create a quiet, urban garden area outside of the luxury high-rise currently being constructed. 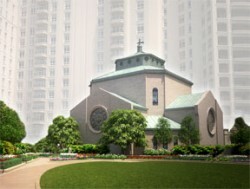 Scheduled to open in the spring of 2012, the restored Chapel, Shrine and urban garden will offer individuals of all faiths a peaceful sanctuary for prayer, worship, reflection and an opportunity to learn about Mother Cabrini, the Universal Patron Saint of Immigrants and the first American citizen to be Canonized. For more information on Mother Cabrini and plans for the reopening of the National Shrine of Saint Frances Xavier Cabrini visit cabrinishrinechicago.com.